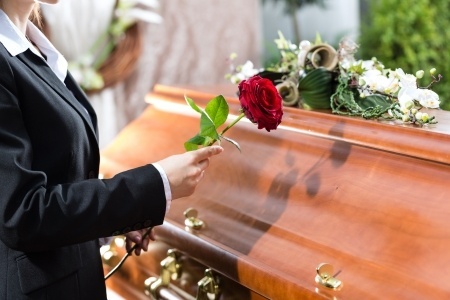 Traditional Full-Service Funerals: This type of funeral usually includes a viewing, a formal funeral service and transportation to a funeral site and cemetery. It is generally the most expensive type of funeral. Direct Burial: The body is buried shortly after death, usually in a simple container. No viewing or visitation is involved, so no embalming is necessary. A memorial service may be held at the gravesite or later. Direct burial usually costs less than the full-service funeral. Direct Cremation: The body is cremated shortly after death, without embalming. The cremated remains are placed in an urn or other container. The remains can be kept at home, buried, placed in a niche in a cemetery, or buried or scattered in a favorite spot. Direct cremation usually costs less than the traditional full-service funeral. A decision about what Funeral Provider to use often involves factors like how close the provider is to the home, if the family used the provider in the past or if the provider has been recommended by a trusted person. But by limiting the search to just one funeral home you may risk paying more than is necessary. You can compare prices over the phone. Federal law requires funeral providers to give price information on the phone, if asked. In addition, many funeral providers will mail you their price list. If you visit the funeral provider in person, they are required to give you a general price list (GPL). If the price list does not include the prices of caskets, the funeral provider must show you the price list of those items before showing you the items.